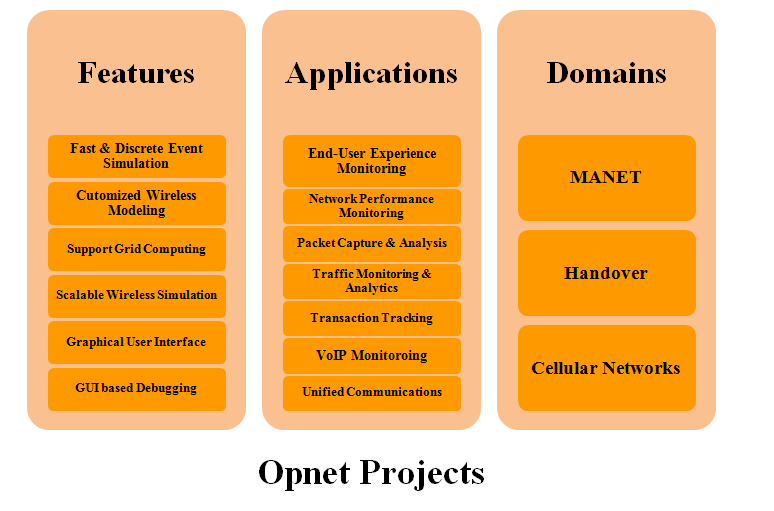 OPNET Projects is an important software simulation tool used widely in network projects. We offer M.Tech opnet projects for research scholar to describe the implementation of routing model, traffic forwarding system, various services in networking and proper packet send & receive system model. We support M.Tech academic projects to handle advanced technology in wireless network such as vertical handover, buffer occupancy, mobility and services. We ensure M.Tech opnet projects with efficient simulation methodology of network device such as routers and gateway. We provide modern power system composed of advanced metering infrastructure for reliable two way communication. We determine WI-MAX & fiber optic communication system need AMI communication system. We use opnet to analyze review of AMI communication with network infrastructure. We establish smart grid as electrical grid and electrical power system to perform complex modification at low, medium level and high voltages. We efficiently simulate opnet with real world power control system. We develop MERCONE a part of wireless local area network. We ensure opnet as better simulation environment for telecommunication system we build & model MERCONE by opnet architecture. WLAN access point and radio interference are simulated by opnet. We developed more than 90+ projects in opnet with WLAN communication by our team. We validate & test mercone model by opnet simulation. We determine opnet ensure efficient simulation result for handover application. We define handover as cellular communication transfer information from core network or earth station to another channel. We propose voice call hand over scheme with radio access technology for long term evolution which efficiently handled by opnet simulation. We ensure multipath routing protocol with cross layer communication in physical medium access and routing layer. 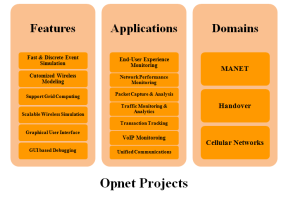 By opnet tool, we can compare the performance of multipath routing protocol and other routing protocol in MANET. We propose freeze TCP algorithm in opnet to examine hard handover in wireless communication we connect two nodes in wireless communication in some scenario receiver want to revoke and transmit zero window advertisement to network node. By freeze TCP algorithm we can predict node disconnection & connect to another network to recover same level transmitting. We efficiently simulate working process, implementation, destination node revocation, source destination formation, number of packet transmission rate, & handover application by opnet simulation tool.